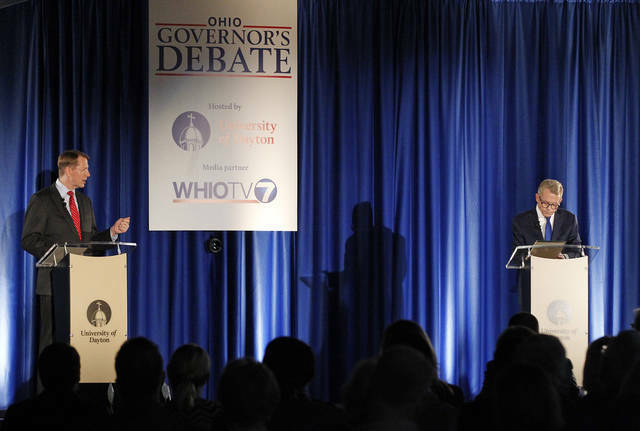 DAYTON (AP) — Ohio’s major-party governor candidates were harshly critical of each other in a spirited first debate Wednesday, jabbing each other over contrasting policy positions on opioids, abortion and e-schools and poking the other’s record in public office as a failure. The evening’s rapid-fire exchanges, attacks and one-liners contrasted with the race’s reputation as a sleepy contest between two boring politicians. Democrat Richard Cordray, who served as consumer watchdog under President Barack Obama, set the tone at the University of Dayton seconds after shaking Republican Attorney General Mike DeWine’s hand. Cordray, 59, criticized DeWine as a career politician who believes the governor’s chair is the next step up the ladder, then said he had failed to do enough to stop the state’s opioid epidemic as the state’s top law enforcement officer. “I will face down the drug traffickers and the big drug companies to fix the opioid crisis, but, Mike, you have had eight years to deal with this problem and you have failed Ohio,” Cordray said. DeWine, 71, said Cordray was “living in a fantasy world” by claiming DeWine had not used his office effectively to fight pharmaceutical companies, e-school corruption and gun violence. He said Cordray left the office in disarray. “You do nothing. You’ve been a failure at every job you’ve ever had,” DeWine said. The two are vying to succeed Republican Gov. 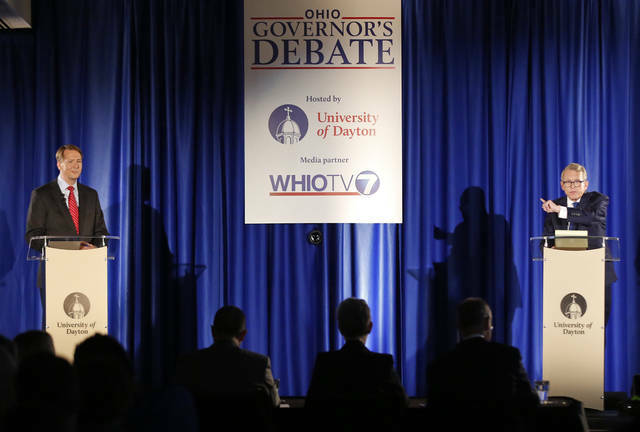 John Kasich, who’s term-limited, in one of the season’s highest profile governor’s race. On abortion, Cordray said he would veto a so-called heartbeat abortion bill limiting the procedure when the first fetal heartbeat is detected. After he was prodded by Cordray to state his position, DeWine said he would sign the stringent restriction if it crossed his desk as governor. The candidates’ positions also differ on Issue 1, a statewide ballot question that calls for reducing criminal sentences for non-violent drug offenses. Cordray called DeWine’s statement misleading and that he was “living in the past.” He said too many Ohioans are in prison for such offenses and there are more humane, productive and cost-effective solutions for drug offenders. DeWine came out strongly against legalizing marijuana for recreational use and jabbed at Cordray for skirting the issue in his answer. Once pressed, Cordray said if recreational marijuana is back on the ballot, he would vote in favor of it — but he believes the question should be put to Ohio voters. 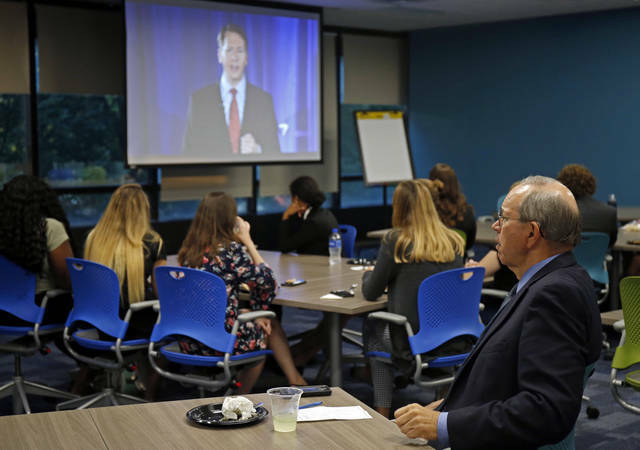 Cordray attacked DeWine for failing to do enough to protect Ohioans from the now-shuttered e-school ECOT, or the Electronic Classroom of Tomorrow, which Ohio education officials say overbilled the state $60 million by inflating attendance.